One morning, I’m standing at the edge of towering cliffs overlooking a vast land of multi-colored stone pinnacles. The next afternoon, I’m clutching the seat of a four-wheel vehicle as it inches along a narrow dirt road above a sheer 1,300-foot drop to the valley floor below. These were among a variety of opportunities to be experienced when exploring the five national parks that are strung across southern Utah like jewels on a necklace. Much of this natural splendor may be viewed from the road and strategically located scenic overlooks — a term that amid such all-encompassing beauty quickly becomes redundant. Those with the time and energy may enjoy more close-up encounters with Mother Nature at her best. The choices range from hiking, biking and horseback riding to kayaking, whitewater rafting and jet boating. It was here that I came to a true understanding of the term “red rock country.” While countless hues of red predominate, the landscape also is painted with splashes of gray, tan, chocolate and the “desert varnish” which covers some rock faces with a shiny black façade. Along with color variations, each park envelopes the visitor in a unique environment very different from the others. 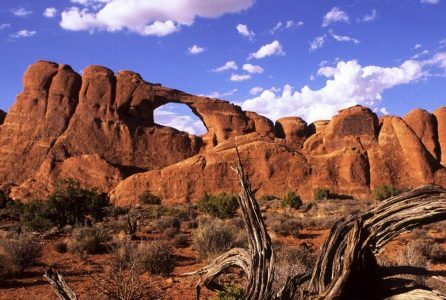 While aptly named Arches National Park is the second smallest of the five, it contains the greatest concentration of natural stone arches in the world — some 900 that measure at least three feet in diameter. The varied landscape also boasts cliffs and deep canyons, pinnacles and plateaus, and everywhere a rainbow of colorful rocks. Of course, arches are the main attraction. The graceful Delicate Arch is the best-known span in the park. Landscape Arch, the longest known rock span, stretches the length of a football field. Other natural wonders with man-given names include the rock skyscrapers of Park Avenue, Devil’s Garden and the Windows, consisting of four large openings that may be viewed from the road. While only a short drive from Arches, Canyonlands National Park — the largest of the five — presents a very different façade. Here is quintessential western canyon country of towering buttes and mesas, colorful cliffs and deep canyons. Given its size (527 square miles vs. Arches’ 119 square miles), Canyonlands consists of three separate districts. Island in the Sky is a towering wedge-shaped land island. The view from the top stretches across rows of canyons to the horizon 100 miles away. 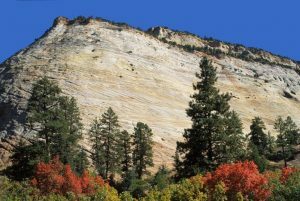 The Needles District is named for a maze of red- and white-banded pinnacles, along with a jumble of rock spires and gorges. Names of distinctive formations — Elephant Hill, Angel Arch and Paul Bunyan’s Potty — are as colorful as they are descriptive. The labyrinth of canyons and pillars of the Maze District makes it one of the most remote places in the country. Only the most intrepid travelers venture there, by foot or four-wheel-drive vehicle. 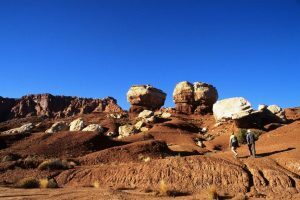 One glance at the towering, white rounded domes in Capitol Reef National Park explains how it got its name. The white Navajo Sandstone dome formations are found on the Waterpocket Fold, a 100-mile long rocky spine preserved within the park. The local word reefrefers to a rocky barrier to land travel, much as ocean reefs are barriers to sea travel. Much scenery in the park is visible during the 10-mile drive through its main section. Walking on the Pioneer Trail, which follows an old wagon route, I spotted the names of pioneers and prospectors along with dates as early as 1871 when they passed that way scratched on the sidewalls. 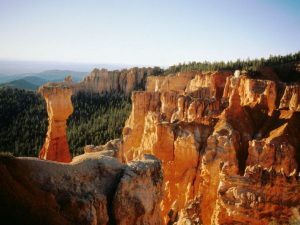 With the very different experiences they offer visitors, Bryce and Zion National Parks are many people’s favorites. At Bryce, the smallest of the five at just 56 square miles, the most dramatic views combine overlooks down into canyons with panoramic vistas to the distant horizon. Limestone pillars stretch as far as the eye can see. Those delicately carved “hoodoos” rise from amphitheater floors in an endless variety of sizes, shapes and colors. Native Americans poetically named the place “Red rocks standing like men in a bowl-shaped canyon.” Ebenezer Bryce, the first non-Indian settler in the area and for whom the park is named, just called it “one hell of a place to lose a cow.” Keen-eyed visitors may spot craggy creations that resemble a pioneer woman in a bustle skirt and the image of a hunter wearing a hat. Above it all stands Queen Victoria, seemingly reigning over her rock subjects. At Zion National Park, by contrast, visitors look up, up and —up, viewing the soaring sandstone walls from valley floors, a perspective which serves to accentuate the walls’ massive size. With elevations that range from 3,300 to 8,800 feet above sea level, it’s not surprising that Zion houses a variety of habitats. They vary from semi-desert conditions along canyon floors to cool, moist plateaus at the upper levels, which mountain lions and big horn sheep find to their liking. The grandeur that surrounds and rises above you at Zion provides a fitting finale to a national park tour of Utah. The parks amaze the eye and provide countless memories — and photographs that, looked at later, can only hint at the beauty you have observed.